With its modern looks and comfortable seating, you’d be forgiven for thinking the CityTree is a good-looking piece of urban furniture. However, it’s much more than that. 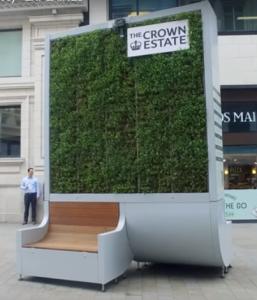 Designed by the German techs at Green City Solutions, the CityTree is capable of producing the same amount of fresh air as 275 trees. It also takes up 1% of the space that would be needed by hundreds of trees in an urban park. How does the CityTree work? The CityTree uses 1,682 pots of specially selected mosses that are particularly well suited to removing pollutants and particulate matter (PM) from the urban air….